﻿ Eddie the Eagle - British Ski Jumper Michael Edwards » True. Sports. Movies. “The Ridiculous True Story” of Eddie the Eagle, as described in a GQ article, is unlike any other “inspired by a true story” movie because the main character doesn’t win at the end; in fact, he finishes last. Michael Edwards, aka “Eddie the Eagle”, was born on December 5, 1963 in Cheltenham, England. He grew up competing as a downhill skier and was the last member cut on the British National Ski Team for the 1984 Olympic Games in Sarajevo. Not to be denied, Edwards sees a poster of a ski jumper on his wall and decides that’s his path to the Olympics. He finds a loophole in Olympic rules where every country is permitted to send their top athletes to compete in each Olympic sport. Upon learning that Great Britain has not had a representative in the Olympics in ski jumping since 1929, he realizes that if he could qualify, there would be no one competing against him for a spot on the team. He moves to Germany to train and befriends Petra, the tavern owner who allows him to sleep in her tavern in exchange for Edward’s help around the tavern. Eddie begins to train on his own until an ex-ski jumper named Bronson Peary takes pity and agrees to train him. Soon, Edwards starts competing in the ski jumping circuit in attempts to qualify for the 1988 Olympics; to do so, Eddie simply needed to land a jump in the 70m event. He does so with a jump of 34 meters, breaking the British ski jump record of 22.9m from 1929. However, British Olympic committee officials, in an effort to keep Eddie from embarrassing their nation, decide to change the rules and requires a qualifying jump of least 61 meters. Discouraged but not defeated, Eddie continues to training and compete on the circuit. At the final qualifying event, Edwards lands a 61m practice jump, but fails to do so on his official jump and does not qualify for the Olympics. Devastated, Eddie finally gives up his dreams and returns home to work with his father as a plasterer. One day, he receives a letter stating that his qualifying practice jump is valid and that he is eligible to compete in the 1988 Winter Olympics. Below is the actual footage from Eddie the Eagle’s jump at the 1988 Calgary Winter Olympics. Eddie the Eagle’s real first name is “Michael”. He got the nickname “Eddie” (derived from his last name) in grade school. The nickname “Eddie the Eagle” was first mentioned when he arrived in Calgary for the Olympics and in the airport terminal, a fan club had a banner saying “Welcome to Calgary, Eddie the Eagle”. Eddie’s coach, Bronson Peary, is a fictional composite character. Eddie was coached by two men, Chuck Berghorn and John Viscome, with Berghorn the one more commonly associated with Edwards. Peary’s coach, Warren Sharp, is also a fictional character. 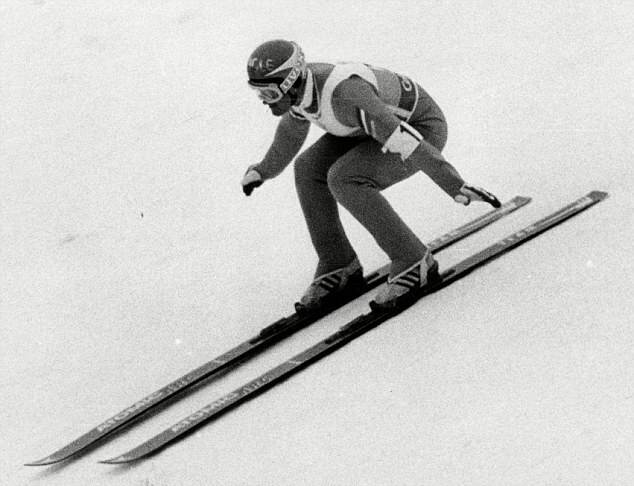 The movie portrays Eddie as awkward, bumbling individual when in reality, he was an experienced downhill skier that narrowly missed making the 1984 Great Britain Olympic Team. In real life, Eddie did not move from the U.K. to a training facility in Germany to learn ski jumping after seeing a poster on his wall. Instead, he had been training in Lake Placid, New York, but was running out of money and needed to find a cheaper alternative. He took a look at the ski jump slopes and decided that was it. With no financial sponsorship and with no ski jumps in Britain, Edwards borrowed his mum’s car (not his dad’s) and drove around the ski jump circuit in Europe, in attempts to qualify for the Olympics. Eddie had to work a variety of odd-end and part-time jobs to pay his way. He was staying at a Finnish mental health hospital when he learned that he qualified for the Olympics. In reality, Eddie was so short on money that when he broke his jaw practicing, he simply tied it up himself with a pillowcase because he couldn’t afford the medical bills. Eddie didn’t dig through the lost and found pile to find an outfit that fit, as depicted in the movie. In reality, he would wear six pairs of socks in order to fit into his second-hand boots, and tied his helmet on with a string because it was also too big. The Italian team did eventually provide him with a better fitting helmet out of generosity. In the movie, Eddie is devastated when he falls on his last official jump and pleads to the officials that his practice jump, which he landed at 61m, should count. The officials deny his request, and a devastated Eddie returns home to work with his father as a plasterer. Later, he receives a letter stating that his qualifying practice jump is valid, and happily tells Bronson that he’s eligible to compete in the Winter Olympics. Bronson tries to dissuade him, promising that he will make a complete fool of himself and his country if he goes, but Eddie is undeterred, noting that competing in the Olympics was always enough for him. In reality, this entire sequence of events did not happen. It’s true that Eddie’s failings in the ski jumping competition made him an instant celebrity and his goofy personality made him a fan favorite and a celebrity on late-night talk shows and tabloids. It’s also true that his detractors grew increasingly frustrated with his antics, claiming that he was making a mockery of the sport. Shortly after the 1988 Olympic Games, the requirements to compete in any event were changed. The International Olympic Committee instituted the “Eddie the Eagle Rule”, which stated that all Olympic hopefuls need to place either in the top 50 competitors or in the top 30 percentile in internal competition. Michael “Eddie the Eagle” Edwards received so much publicity and endorsement offers between the end of the first event, the 70m jump, and the start of the second event, the 90m jump, that the British Skiing Federation had to set up a trust fund and a manager to help him manage his affiars. When Eddie returned to London after the 1988 Winter Olympics, Heathrow airport swarmed with press and fans. He was immediately escorted off to a London recording studio that same day to record a single, Fly Eddie Fly. The next day, his hometown of Cheltenham held a civic reception in his honor. Edwards began to command as much as £10,000 an hour to make public appearances. Taking advantage of his fame, Eddie estimated that he earned between £500,000 and £600,000 in 1988 alone. Edwards continued his ski jumping career in Europe and by 1998, he was jumping distances of 85m and 115m on the 90m and 120m jumps respectively, but he would never qualify for another Olympics. He had to declare bankruptcy in 1992 because his trust fund (more than £1 million) had been poorly managed and he was unable to pay a tax bill; Edwards eventually settled out of court against his trustees and was able to recover approximately £100,000. This experience inspired Eddie to become a lawyer; while studying for his law degree, he worked as a part-time radio presenter. This is when he met his wife, Samantha Morton. In 2003, they got married in a drive-through ceremony at the Little White Wedding Chapel in Las Vegas. The couple have two daughters, Otillie (age 11 in 2016), and Honey May (age 8 in 2016). In 2014, upon returning from doing some television work in Germany, he returned home to find out that his wife wanted a divorce. For the next two years, while the divorce was being finalized, he slept in a garden shed outside the home they owned. The divorce finalized in 2016 and according to Eddie, approximately 85% of his fortunes were wiped out. Chuck Berghorn is the primary character of whom Bronson Peary is based. Berghorn, who battled genetic alcohol addiction, was not happy with Peary’s portrayal as a drunk. He states that he was always sober in his interactions with Edwards. In fact, Berghorn doesn’t consider himself an expert ski jumping coach, but more of an expert in maintaining ski jump facilities. As of 2016, Chuck still resides in Lake Placid.